ATTENTION: Close-out sale! 45% off. All sales are final. 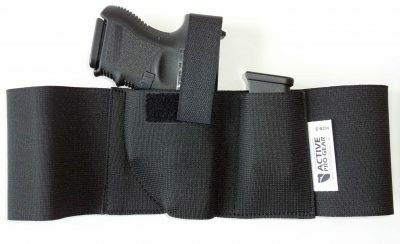 This new, inside-the-waistband (IWB), belly band-type SafeGuard Concealment Holster allows you to conceal carry up to two guns or extra magazines in comfort, while wearing anything you want—shorts, jeans, t-shirts, pants, sweats. Nothing shows on the outside. There is no “give-away” belt clip to reveal you are carrying a concealed weapon or limit how low on the waistline you can place your handgun. The unique design holds the gun very close to your body for maximum concealment. The tension from your clothes and belt will hold the gun close to your body and make the gun “disappear”. 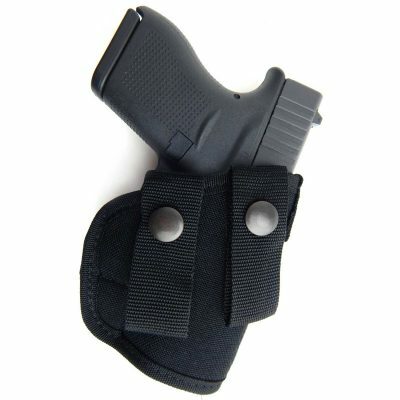 The SafeGuard Concealment Holster is a quality IWB holster designed for no-nonsense, practical everyday use. It is one of the most versatile and comfortable method of deep concealment available. You can wear it in almost every situation! Whether you dress up with a tucked in shirt for the office or go to the gym in a t-shirt, The SafeGuard Concealment Holster will be there, totally concealed and ready! EXTRA ITEMS: The pocket can carry an extra magazines, speed strips, money, folding knife, flashlight, multi-tool or other small items. QUALITY PRODUCT: Made from premium USA-Made breathable elastic and Velcro for extreme concealability. This special lightweight, long-lasting elastic has a unique plush finish on one side so it feels like velvet on your skin for a comfortable, all-day carry. You’ll forget you’re carrying a gun! Full 4″ wide. AMBIDEXTROUS: Will work for either right or left hand draw. This card reveals, step-by-step, exactly what to do after the confrontation ends and the confusion begins. It contains vital information to protect you! If you carry a gun for protection, you can’t afford to be without this card in your wallet or purse. Now you can get this card absolutely free, just by trying the SafeGuard Concealment Holster—at no risk to you! I liked the fact that the holster material did not cause a sweat problem. I was not 100% happy with the fact that the unit required using the pants to hold the top of the gun against the body but using it that way did secure the gun very well. I have several Active Pro Gear products and think they are great products and I carry every day using the deep conceal units I have had for years.